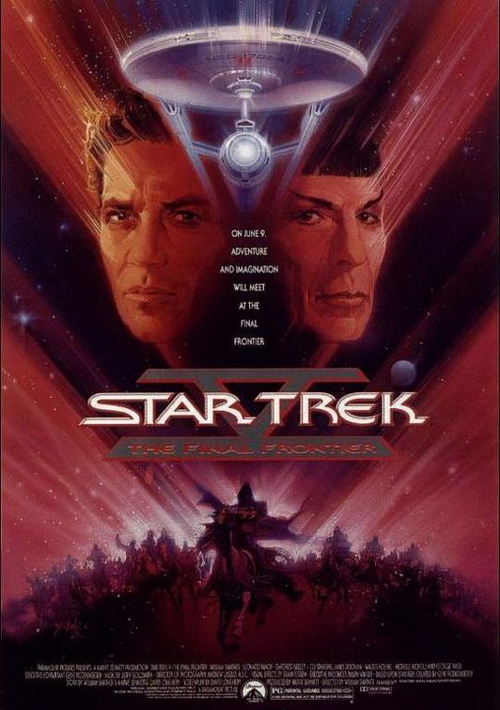 (SPOILERS) As much as everyone agrees The Wrath of Khan is the granddaddy of big screen Treks (particularly makers of subsequent generations or reboot movies), there’s equal concordance that Star Trek V: The Final Frontier is the nadir (albeit, some put forward Nemesis as a contender for the crown). You know what, though? I rather like it. I’d even go as far as suggesting that, of The Original Series movies, it’s more rewarding than The Search for Spock. True, the screenplay is far from up to snuff, some of the guest cast are less than commanding, and the effects are (mostly) nothing to be proud of, but in its notable favour, William Shatner proves a considerably more engaged director than Leonard Nimoy was, and there’s a resulting vibrancy and spiritedness to The Final Frontier that makes it – somewhat – unfairly maligned. I’d add the caveat that I don’t think the Shat is a great director, but he’s definitely thinking about what he’s doing, and getting results while under pressure (time and money constraints afflicted the picture, thanks to a combination of a writer’s strike, Paramount pushing to hit a release date and cutting the budget, and ILM’s unavailability for the effects work). If he comes a cropper occasionally (when envisioning several alien planets, it’s advisable to ensure they look sufficiently distinct from each other; “God’s” world at the end, after the Mojave Desert of Nimbus III, is just the Mojave Desert again. It recalls Doctor Who’s Planet of Fire going to Lanzarote, filmed as Lanzarote, and then visiting an alien planet that looks… just like Lanzarote), he also produces some striking results in tandem with cinematographer Andrew Lazlo (who had just come off Innerspace). The desert pre-credits scene, introducing Sybok in shimmering slow motion, sets us up for a visual feast Shatner can’t quite pull off, but this never resembles the TV movie direction we associate with Nimoy, and that’s something to be grateful for. Bones: Are you sure about that? Spock: I am well-versed in the classics, Doctor. 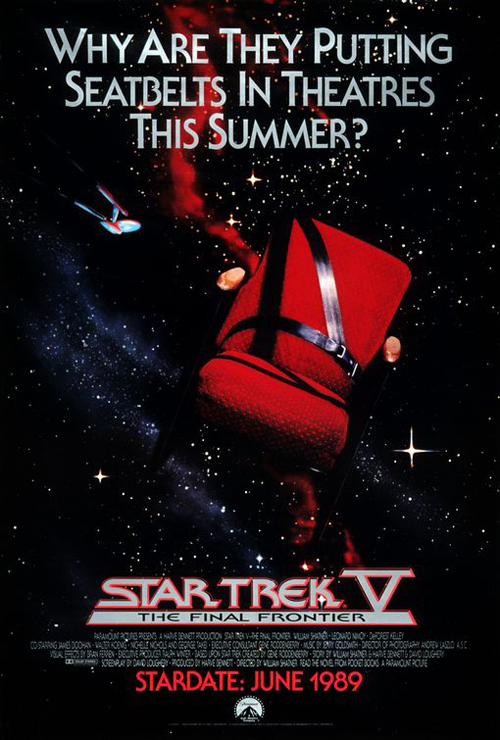 Less so is the screenplay, which went through a series of revisions from Shatner’s original concept; on looking it over, Harve Bennett referred the treatment as a tone poem rather than an adventure story (you can see something of where he was coming from in the final movie, which doesn’t have the feel of a set piece-driven picture; it’s far more focussed on conversation and character moments), then suggested David Loughery write the screenplay after Nicholas Meyer proved unavailable (I can’t see Meyer delivering what the Shat wanted anyway, to be honest, particularly as it seems he didn’t like Loughery’s reshaping and had it partially returned to his preferred vision). Gene Roddenberry didn’t think much of the God idea, it seems, despite having wanted The Motion Picture to explore this concept more fully. And also despite the essential “false promise” premise being a familiar one from the TV show (rather than the truncated climax, which Shatner was unable to complete as planned when the budget fell through, the biggest problem is that the reveal is entirely predictable; it’s the only reveal it could be). But then, Roddenberry never seemed to be happy, and when he got his way Trek ended up unforgivably dull, as per the first few seasons of The Next Generation. Kirk: Who am I? Don’t you know? Aren’t you God? It’s curious that the Shat was inspired by a distaste for televangelists and their ability to sell the idea that God was talking through them, since that isn’t really the takeaway from Sybok (Laurence Luckinbill) and his mission. For a start, he clearly fully believes in what he’s doing, hence his horror at his misguided gullibility when “God” reveals his true colours (“What have I done? This is my doing. This is my arrogance. This is my vanity”). Then there are his healing powers, be they derived from his connection to the entity or otherwise (I see Wiki indicates they come via his telepathic Vulcan heritage). Those he touches do appear to experience relief; the Shat may have been satirising the euphoria resulting from the laying on of hands, but if he was attempting to depict televangelists as charlatans, Sybok’s demonstrable ability to resolve others’ pain (demonstrable because we see it visualised) is a funny way of going about it. And, since his followers don’t drift away after the buzz wears off, it would appear to be a permanent fix. Sybok’s skillset rather reminds me of Holy Wayne in The Leftovers, and with Damon Lindelof being a Trekkie it wouldn’t surprise me if The Final Frontier had beeninfluential (in The Leftovers too, the experience is real, and there too the root of it remains moot). The closest The Final Frontier comes to directly addressing Christian concepts of God (the original treatment had God turning into Satan) is Kirk’s denouncement that “I doubt any God who inflicts pain for his own pleasure”, with its implicit criticism of the God of the Old Testament. Kirk: Excuse me… Excuse me… I just wanted to ask a question. What does God need with a starship? The above being The Final Frontier’s most famous line, of course. The Shat’s approach to belief and divinity lack finesse, certainly, but it’s very much in keeping with The Original Series’ moral underpinnings. One of the picture’s best scenes – perhaps surprisingly, since Shatner maintains a determinedly jokey and jaunty tone throughout – finds Sybok attempting to take away the pain of our central trio (having performed the honours on Uhura, Sulu and Chekov). He succeeds in doing so with McCoy (Kirk was originally set to find himself going it alone, Spock and McCoy allying themselves with Sybok, but Kelly and Nimoy vetoed the idea; the former gets the rather weak “I, er, I guess you better count me out” in response to Sybok’s offer, though, going with the flow of his mates), in an excellent little sequence were Bones re-experiences the demise of his father and the ethical dilemma he faced in euthanising him, and then the one-two punch of a cure being found not long after. Kelly’s performance is first rate here, but Kirk’s subsequent speech about our pain being one of the things that makes us who we are, and that if we lose it we lose ourselves, is a rather pat, typically humanist and egocentric attitude to the special merit of our species (and so could have dropped right out of a sermon to some less comprehending alien or machine intelligence from The Original Series). It’s that connection to The Original Series that lends Sybok something of the quality of an aging new-ager, whose dream is on its last legs; there’s no place for his quasi-spiritual yearnings in the materialist ‘80s, outside of forming a David Koresh-esque cult, that is (notably, he and his band are referred to as terrorists at the outset, another indication of the picture taking cues from its cultural landscape). It’s certainly curious that there’s little upfront explanation for Sybok’s link to the entity and what the entity actually is; The Final Frontier’s plot has been compared to The Motion Picture’s but I’m not sure that’s really fair, any more than comparing The Motion Picture’s to The Voyage Home’s. Both involve the Enterprise being hijacked by an external force intent on meeting the creator, and find the main trio gathering in a “temple” in the third act, but The Motion Picture poses itself in the form of a logical riddle, to which there are concrete answers, while The Final Frontier, dealing in the world of emotive beliefs and self-trickery, is more nebulous in its conclusions. Added to which, they’re aesthetically poles apart. God is, of course, realised as just another floating head at the end (so fulfilling the traditional “God-look” criteria), a masquerading alien entity that is remarkably easy to kill with traditional weaponry; it is Sybok who provides the thrust of the tale, although most discussed is his controversial status as Spock’s half-brother. Not being a devout Trekkie, I don’t have a particular problem with this, other than that Luckinbill doesn’t really have the impact a potentially game-changing forgotten sibling should have. This might be one of the reasons it’s been very easy to simply ignore the character subsequently. Luckinbill’s not bad by any means, but he lacks the edge an antagonist needs; he’s too amenable, too unthreatening (by which I don’t mean physically threatening, as that would detract from a refreshingly different approach to the villain role in these movies). Both Sean Connery (for whom the character was written) and Max von Sydow would have been interesting choices, had either accepted the offer (a Scottish Vulcan!) It’s a role that required a heavyweight, someone instantly memorable, even if he wasn’t a name actor. The rest of the guest characters are even less lucky. David Warner barely makes any impression outside of his name (St. John Talbot), while Charles Cooper (Korrd) at least gives James Doohan a run for his money in copiousness. Oddly, a couple of stunt performers are cast as the main Klingon antagonists (Todd Bryant and Spice Williams-Crosby) adding to the feeling this is a bit of a low-rent production. There’s also a tri-breasted catwoman, amongst generally unremarkable make-up work, so the Shat got in there a year before Verhoeven (in mammary count, rather than felinity). And, while the central trio are expectedly catered for, the lesser stalwarts are eccentrically provisioned to say the least. Credit to Shatner, he’s diligent in ensuring everyone gets something, usually with a humorous twist, but the dialogue and delivery is sometimes too self-consciously jokey, written as a “bit” rather than arising from the scenario. So we have Chekov (Koenig complained that he only shot eight days on the movie) attempting to pretend he and Sulu are caught in a blizzard (“Sulu, look. The Sun’s come out. It is a miracle!”), but on the other hand the latter gets to manual land a shuttle in a “big” action set piece. More curious are Scotty and Uhura, with the seemingly random decision to give them a flirtatious relationship, before Sybok weaves his magic (perhaps Uhura likes chunky); we should just be grateful Simon Pegg didn’t pick up on this for the back of Star Trek Beyond. Doohan gets the famous “I know this ship like the back of my hand” slapstick moment, which is, in fairness, well-executed (but I well remember it being one of the main promotional clips, along with Doohan recounting how the extensive corridor set was built especially for the joke, which rather over-exposed it), and offers Koord a tipple (“Would you care for a wee nip of Scotch whisky?”; their drunken escapades might have been worth a series). Spock: Perhaps “because it is there” is not sufficient reason for climbing a mountain. Where The Final Frontier consistently delivers, however, is with Kirk, Spock and McCoy. Fortuitously so, since it’s the last time they will be consistently in each other’s company. Shatner takes his time establishing their bonhomie. Leisurely, some might say lazily, as they camp out in Yosemite National Park. Kirk doesn’t actually make love to El Capitan (see the video below) but the Shat is clearly intent on making Kirk a paunchy action star to be reckoned with (and getting the jump on Cruise’s free climbing by a decade). The dialogue throughout is replete with appealingly bad puns and plays on words (“I don’t think you realise the gravity of your situation”; “Hold your horse, captain”; “We’ll need all the power we can muster, mister”) and Blazing Saddles-esque innuendo (“Bourbon and beans – an explosive combination”). Bones is as irascible with Spock as ever (“God, I liked him better before he died!”) and cantankerous generally (“Jim, you don’t ask the Almighty for his ID!”), and there’s some great casual sniping (Kirk: I could use a shower; Spock: Yes), as well as some really funny Shatner business (Bones: What’s the matter, Jim? ; Kirk: I miss my old chair). It should also be duly recognised that the Shat is truly the master of the double-take. McCoy: I’ll say one thing for you Spock, you never cease to amaze me. The beats are predictable in terms of who does what, but immensely satisfying. Thus, Spock gets to be sage and unflappable. He nerve pinches a horse, exhibits congruent disinterest in nostalgia (“I do not often think of the past”), and coolly rejects Sybok’s angle of influence, attesting “I hide no pain”, which he proceeds to prove in response to a vision of Sarek’s disappointment in newborn Spock’s humanity. As such, his resistance (“Sybok, you are my brother, but you do not know me”) is more satisfying than Kirk’s macho posturing, embodying the quality of one who doesn’t even need to entertain responding on Sybok’s level. Kirk: Spock, we’re on leave. You can call me “Jim”. Spock: Life… is NOT a dream. Kirk: Go to sleep, Spock. While the thematic elements are unsubtle, they’re nevertheless pleasingly played out. From the “Row, row, row your boat” philosophical enquiry (“I was trying to comprehend the meaning of the words”) that is revisited beyond the Great Barrier (Bones: Are we dreaming? ; Kirk: If we are, then life is but a dream; ideally the visualisation would have been a bit more wondrous, although I do quite like the effects for the blue God planet) to Kirk’s clumsy-but-likeable statement of heroic solitude (“I knew I wouldn’t die, because the two of you were with me. I’ve always known, I’d die alone”), revisited when he is rescued by the new Klingon gunner (Kirk: I thought I was going to die; Spock: Not possible, you were never alone). As has been noted, however, Kirk isn’t alone when he eventually dies, in rather ignominious fashion. Spock: You ordered me to kill my brother. Kirk: You mean he’s your “brother” brother? Kirk: You made that up. Kirk: You did too! Sybok couldn’t possibly be your brother, because I happen to know for a fact that you don’t have a brother. Spock: Technically, you are right, I do not have a brother. Spock: I have a half-brother. Kirk: I have to sit down. Spock: I’ve lost a brother. Kirk: Yes. I lost a brother once. I got him back. McCoy: I thought you said men like you us don’t have families. Certainly, this exchange is far superior to Kirk’s groan-inducing philosophical speculation on God’s existence (“May he’s not out there, Bones. Maybe he’s right here (pointing to his chest). Human heart”), like we couldn’t see that coming a mile off. A number of Shatner’s choices are ill-advised; design-wise certainly, as the field outfits look like an assistant popped down the army surplus store at lunch time, and for some reason Kirk now has a suede officer’s jacket. And the title is as uninspired as they come (although that may have been by studio edict). But bringing Jerry Goldsmith back was a good move, on balance, even if he seems to be recycling his Motion Picture score wholesale. Paramount refused the director a special edition (considering the immense lucrative value of their franchise cash cow, they’re quite remarkably stingy), as he particularly wanted to have another go at the ending. As half-arsed as that is, though, I suspect it would remain less than satisfying whatever he did with it. The picture’s premise is a classic pipedream that can never ultimately satisfy an audience. At least, unless someone got to go really crazy with it, which was never going to happen. The Final Frontier’s bad rap is certainly understandable; it’s indulgent, ramshackle, slipshod and makeshift, and really needed a propulsive plot. But crucially, it’s also fun. While it may lack the skilled construction of The Voyage Home, it is equally good-natured. While Star Trek V: The Final Frontier is definitely one of the lesser Trek movies, what it has going for it is that it’s engaged. It may not quite work, but it wants to work, and the enthusiasm of its director just about sees it through.